Enjoy this short video guide to help you navigate your way to Weissman's Peachtree City office. Traveling on I-75 South into Atlanta, transfer to I-85 South, cross I-285, then travel South on I-85 to Exit 61 (Peachtree City / Fairburn exit). As you exit I-85 turn left, crossing over I-85. You will be going South on Highway 74. Travel 11 miles on Hwy 74 South. Immediately after you pass under the golf cart bridge, you will turn left onto Westpark Drive (Pike’s Nursery is on the opposite side of the street). If you reach a stop light, you’ve gone too far. The Hampton Inn will be on your immediate left. Our building - Commerce Center - is the first building (red brick) in the second block on your left. Traveling on I-85 South into Atlanta, continue on I-85 through the city, crossing I-285, and exit on Highway 74, or Exit 61 (Peachtree City / Fairburn exit). As you exit I-85 turn left, crossing over I-85. You will be going South on Highway 74. Travel 11 miles on Hwy 74 South. Immediately after you pass under the golf cart bridge, you will turn left onto Westpark Drive (Pike’s Nursery is on the opposite side of the street). If you reach a stop light, you’ve gone too far. The Hampton Inn will be on your immediate left. Our building - Commerce Center - is the first building (red brick) in the second block on your left. Traveling on I-20 East into Atlanta, exit South on I-285 and continue around to I-85 South. Travel South on I-85 to Exit 61 (Peachtree City / Fairburn exit). As you exit I-85 turn left, crossing over I-85. You will be going South on Highway 74. Travel 11 miles on Hwy 74 South. Immediately after you pass under the golf cart bridge, you will turn left onto Westpark Drive (Pike’s Nursery is on the opposite side of the street). If you reach a stop light, you’ve gone too far. The Hampton Inn will be on your immediate left. Our building - Commerce Center - is the first building (red brick) in the second block on your left. Traveling I-20 West into Atlanta, exit South on I-285 and continue around I-285 to I-85 South. Continue on I-85 South to exit #61, Highway 74. Turn left back across I-85 and continue for approximately 11 miles. Immediately after you pass under the golf cart bridge, you will turn left onto Westpark Drive (Pike’s Nursery is on the opposite side of the street). If you reach a stop light, you’ve gone too far. The Hampton Inn will be on your immediate left. Our building - Commerce Center - is the first building (red brick) in the second block on your left. Traveling to Atlanta from the South on I-75, exit West on I-285. Continue on I-285 to I-85 South. Continue on I-85 South to exit #61, Highway 74. Turn left back across I-85 and continue for approximately 11 miles. Immediately after you pass under the golf cart bridge, you will turn left onto Westpark Drive (Pike’s Nursery is on the opposite side of the street). If you reach a stop light, you’ve gone too far. The Hampton Inn will be on your immediate left. Our building - Commerce Center - is the first building (red brick) in the second block on your left. Traveling to Atlanta from the South on I-85, exit at Highway 74, exit #61. This exit is approximately 18 miles North of Newnan. Turn right and continue for approximately 11 miles. Immediately after you pass under the golf cart bridge, you will turn left onto Westpark Drive (Pike’s Nursery is on the opposite side of the street). If you reach a stop light, you’ve gone too far. The Hampton Inn will be on your immediate left. Our building - Commerce Center - is the first building (red brick) in the second block on your left. 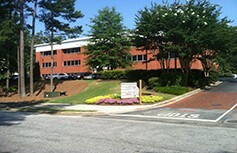 Welcome to Weissman's Peachtree City office. Click below to enjoy an interactive virtual tour of the office.